Christopher Moseley is the Director of Bands/Orchestra at Varina High School in Henrico, VA. He is a graduate of Huguenot High School in Richmond, VA and earned his Bachelor of Art Degree in Music Education from Bethune-Cookman University in Daytona Beach, Florida. Currently he is completing a Master of Music Education Degree at Virginia Commonwealth University. Mr. Moseley’s professional affiliations include the National Association for Music Education, Virginia Music Educators Association, Virginia Band and Orchestra Director’s Association, the International Trumpet Guild, and the American String Teachers Association. Mr. Moseley is the conductor of the Richmond Police Athletic League community band and music director for the Richmond Nativity Pageant. Mr. Moseley has served as guest conductor and adjudicator locally and for the Florida Bandmasters Association. 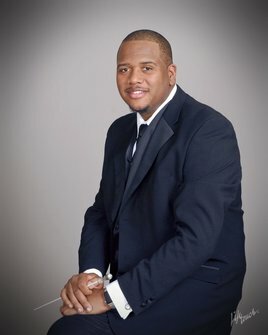 Mr. Moseley has performed on the 20th Century Fox Movie “Drumline”, the Ellen DeGeneres Show, ESPN, EA Sports Video Games, MTV, BET, The Word Network, and Walt Disney World. He maintains an active schedule teaching and as trumpeter in the QuintEssential Jazz Ensemble. Mr. Moseley enjoys traveling and spending time with his wife Erika and their children Jordyn and Josiah.